MAC Belo, Mike Tolomia, and Roger Pogoy are set to rejoin their Far Eastern University teammates in the PBA D-League for the Phoenix Petroleum squad when the Foundation Cup begins next month. FEU athletic director Mark Molina said Belo, Tolomia, Pogoy, and three other graduating players from the school will be playing for Phoenix Petroleum after the company forged a tie-up with the Tamaraws for the D-League. “We’ve talked to our players already. And the six graduating players, we will bring them in sa Phoenix,” said Molina, naming Russell Escoto, Archie Inigo, and Alfrancis Tamsi as the three other graduating players that will form part of Phoenix. 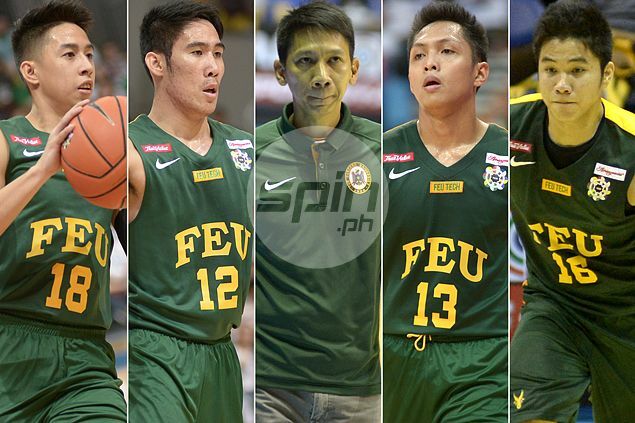 The top stars of the Tamaraws have received offers from other ballclubs, particularly Tanduay, which wanted to have Belo in the fold in its title bid, but the FEU players chose to stay with their D-League squad. “If they have another team who has a better offer, it’s a free country, they can choose if they want to move. Walang problema sa amin ‘yan. But they have already signified their intention to play for Phoenix,” said Molina. Incidentally, Belo will also start attending Gilas Pilipinas practices next month, joining other collegiate stars in Kiefer Ravena and Kevin Ferrer. FEU coach Nash Racela said Phoenix Petroleum is still looking to bolster its squad that also includes Raymar Jose, Richard Escoto, and Ron Dennison. “We have nine from FEU but we will still reinforce them,” said Racela, who will be part of the coaching staff of Phoenix Petroleum but will have Eric Gonzales as the head mentor.